The images we ended up with. A shot of the "photo shoot", featuring Diana, trying to help me figure out correct camera settings, etc. I had ordered gradient photo paper, which finally came in, and we installed in into my homemade "light box". I used a large box (one I had hanging around since 2004 because one of my wheels came packed in it and I just KNEW I would need it for something, someday), cut areas out of three sides, painted it white and attached tissue paper in the holes. Then we took 2 PVC pipes with heavy bases and clipped on some reflectors with 100watt fluorescent bulbs. There was a wild assortment of other lights, cords, boxes, etc to help position room lighting. I think this will work pretty well for "on the fly" shots of new work. Some of the amazing pieces of glass from all ages at the Corning Museum. We only had a couple of hours here but I could have spent a day looking at all the glass. It was a side trip on the way home from New York and time very well spent. Chillingly cold scene looking at the Horseshoe Falls section of Niagara Falls from the Canadian side. It was raining on this day and the fog kept moving in. I was struck by the blueness of the water. In some parts it was almost a Caribeean blue. Beyond this section of the Falls, the river was frozen under the bridge from the US to Canada. I understand it is quite different looking when the weather is warm. I was disappointed that my passport didn't get stamped with a Canadian stamp. Guess it was just because we were there just for the day. After returning from the NC Potters Conference, I have done some rethinking about work, classes, going greener in the studio, etc. All of these relate to the economic situation, mine particularly. I spent some hours putting together my "marketing" plan for the year. That mostly means how and when I will contact my pottery public, whether it is retail or wholesale. I made a decision to only work out of the gallery this spring and summer, except for the committments I had already accepted. This will allow me to make more work for the wholesale side that I started in July of last year and also to set up a retail online store for some of the non-wholesale work that I produce. 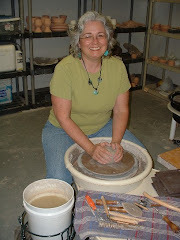 I do feel like I am juggling all aspects of the pottery world like no other time since I started selling work in 1997. On the work side, I have been doing some wholesale orders and getting the studio back in shape. Much disarray in the gallery side led to hours of moving pots and cleaning/dusting. It's almost back there! Stop in and visit if you are in the area. Off to Asheboro to the NC Potters Conference. Very excited about seeing the presenters. More on that later! I've been on a road trip with my family. We had a blast, but chose a rather cold time of year to visit upstate New York, via Atlantic City. This is a view of Atlantic City and the Boardwalk. We were marvelling at the 11" of snow that fell the night we arrived. There was snow on the beach. Quite an amazing sight! My dad and my sister were hooting with glee at the glory of it all. Of course, it rarely snows in coastal Mississippi and they have been known to drive a hundred miles in pursuit of the white stuff. I'll post some more sights of the trip once I recover, including pottery, of course.